Deck balusters: Instead of standard wooden pickets on your deck railing, how about something really eye-catching? There are a variety of extruded aluminum balusters to select from that combine beautifully with wood to create a sturdy deck railing that’s also weather-resistant. Aluminum balusters are available in lots of different baked-on enamel colors, such as black, white, green, bronze, silver and others. Balusters don’t need to be straight up and down either. You can choose from ones that are twisted in classic Colonial shapes, or ones that are arced out in smooth curves or angular bends to suit your particular tastes and style. All of them are pre-shaped, and simple to install. 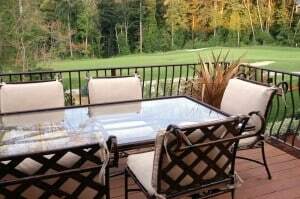 Deck rail panels: How about something even more dramatic to set off your deck rail. There are laser-cut steel panels available with the silhouettes of trees, wildlife and other outdoor scenes. The panels fit into grooves in wooden supports to make up a sturdy deck railing that will really become a unique feature in your yard. You can ring the entire deck with them, or use just one or two panels as a focal point. Solar post lights: Here’s a quick and easy deck upgrade that looks great and is also a nice safety feature. Solar post lights attach to the top of any standard 4-by-4 posts. A small solar panel on top of the light uses sunlight during the day to recharge batteries inside the fixture, which powers LED lights at night. Solar post lights are available in several different styles and colors, and are easy to install with no electrical wiring required. Rail-top planters: You can dress up the look of your deck without utilizing any valuable deck space by incorporating some rail-top planters. These attractive planters are made from vinyl, cedar, or other materials, and are designed with a groove in the bottom that fits over standard 2-by-4 or 2-by-6 lumber. Available in both round pot and rectangular box designs, the planters fit over the top cap of the deck’s railing. They’re easy to install wherever you want to add the beauty and color of fresh flowers on your deck, or even to create a quick herb garden. Patio misters: If you have a deck that’s a little too hot to handle some afternoons, consider the addition of some patio misters. A patio mister is simply a series of micro-nozzles, pre-installed in a length of hose. The hose is attached to the edge of your deck railing, the underside of a patio cover or pergola, or any other convenient location, then attached to an outdoor hose bib. The nozzles deliver a continuous, very fine mist of water, which in turn will cool down the ambient temperatures and make your deck and your outdoor environment much more enjoyable. Patio misters are available in different lengths and nozzle configurations, and there are also accessories such as booster pumps, splitters and even in-line filters to help you customize your installation. Rope lights: For some fun and some added safety, consider adding some rope lights to your deck. Rope lights are tiny bulbs encased in clear or colored flexible plastic tubing, and they can be installed outdoors in a wide variety of locations. They add a festive atmosphere to any deck or patio cover, and provide additional subtle, non-glare lighting for steps, railings and other areas. Look for lighting that’s UL-approved (by Underwriters Laboratories Inc.) for exterior use. Plan sets: Feeling ambitious? If you’d like to tackle an outdoor project that will improve your yard and give you a tremendous feeling of accomplishment, but you’re at a loss as to where to begin, consider buying a set of pre-drawn plans. There are plan sets available for a wide variety of projects, from simple barbecue carts and picnic tables to Adirondack chairs and deck gliders. You’ll find plans for interesting deck railings, pergolas and deck covers, and even for the deck itself. The typical plan set comes with drawings, material lists and assembly instructions, and some are even available with DVDs. You can find these and other accessories for your deck at your local home center, hardware store and lumberyard, as well as at some larger department stores and warehouse stores. And as always, a search of the Internet will yield a wealth of products and ideas. See Paul Bianchina’s feature, Wise Window Shopping.